Welcome to 2017! Did you make any New Year’s resolutions? If so, chances are you set at least one goal related to staying fit and healthy. About 45% of Americans usually make New Year’s resolutions, and losing weight is at the top of the list. We all know that healthy eating is important, but sometimes it’s easier said than done when hectic schedules and tight budgets get in the way. To achieve your goal, a little bit of thought and planning can go a long way! One strategy is to use MyPlate as a guide to brainstorm meals that fit your family’s lifestyle and preferences. I find that it can be helpful to consider three main meal components – grains, vegetables and protein – and think about how to combine those components to make fast, nutritious meals throughout the week. Grains – Grains are often the base of a meal, especially if you’re fixing a skillet dish or casserole. Foods in the grain group include rice, quinoa, barley, pasta, couscous, bread and tortillas. MyPlate recommends we make at least half our grains whole grains, so look for whole grain varieties as available. When you cook a grain such as rice, quinoa, barley or pasta, you may want to fix a full pot so that you have enough to keep in the refrigerator or freezer and use to create “heat and eat” meals throughout the week. Vegetables – MyPlate recommends we make half our plate fruits and vegetables, and this can include fresh, frozen and canned items. I like to roast fresh vegetables in large batches and combine them with pre-cooked grains to create quick meals throughout the week. Frozen vegetables are also a fast and convenient way to add nutrition to meals. Protein – Protein includes meat, poultry, fish and eggs as well as nuts, seeds and beans. As with grains, when cooking meat or poultry, consider cooking enough to last the entire week. You can bake or grill meats, then use them in soups, casseroles or skillet meals in addition to being entrees. Canned beans are great to have on hand to conveniently add protein to your meals. When you take the time to prepare grains, vegetables and protein in advance, it’s easy to throw together a quick weeknight meal. Dairy and fruit can then be added as toppings or side dishes. Do you have any favorite 30-minute MyPlate meals? Look for additional inspiration and share your ideas at MyPlate, MyWins. Recipes that offer variety and flexibility are very appropriate for today’s society. Making MyPlate choices as you make grocery selections helps this week’s meals come together more easily. Brown rice is a nutrition powerhouse that provides whole grains and B vitamins and great energy. Versatility is fun when it comes to rice bowls. Breakfast lunch and dinner all have options that can begin with this inexpensive and nutritious grain. On average a half cup serving of brown rice costs just 10 cents. A good suggestion is to cook a large quantity of brown rice at one time and have it on hand for the week. It freezes well and retains moisture. It can be stored in the freezer for up to 6 months. MyPlate on a Budget is a helpful resource that offers many great tips and recipes that keep food expenses low and nutrient intake high. One of the sections in this online resource is devoted to whole grains. Take a look at the Brown Rice Bowl assortments below and choose some favorites. You can also add your own preferred flavors and come up with unique concoctions. As you incorporate brown rice into your healthy eating pattern, please share some of your creations and most loved ideas with all of us. Your go-to meal or snack may be someone else’s new pick. USDA (United States Department of Agriculture) and MyPlate encourage making half of our grains whole. Adding brown rice to your rotation is one step towards meeting that goal. Once a large batch is cooked, time is saved and by planning ahead you can have a plethora of options at your fingertips. Enjoy! The 5 o’clock panic… what’s for dinner?? If you’ve ever had that 5:00 panic as you get home from work and wonder what in the world you’re going to feed your family for supper… you’re not alone. Most folks either enjoy meal planning or dread it, but for busy families it is a must. Planning your meals can save you time and money and help you serve healthier food. The neat thing is that there is more than one way to do it. Check items you have in your refrigerator, freezer and cupboards that need to be used, and plan your menus using these items first. Serve what they like. When you serve food your family likes, you avoid waste. Gather low-cost, nutritious recipes that your family likes and serve them regularly. Consider your schedule. When creating your menus and shopping list, think about how much time you will have to prepare the meal on a particular day. If it’s a slow week, make meals ahead and freeze them. If it’s a busy week, use some of the meals you froze earlier or just keep it simple with foods that require little preparation. Check newspaper ads. Look at local store ads to find sales. As you become familiar with the costs of regularly purchased items, you will be able to quickly identify good deals. Balance your menus. Use MyPlate as a guide to include foods from all the groups: Vegetable, Fruit, Grain, Dairy and Protein. For more help in planning, tracking and analyzing your diet, check out USDA’s SuperTracker. Get inspired. Sometimes you might need some inspiration or new recipes. You can find healthy low-cost recipes here. You might also trade dinner ideas with friends and co-workers or use ‘theme night’ meals like Taco Tuesday or Sandwich Saturday. Ethnic foods can open a whole new set of recipes… try Italian, Asian, Mexican, even Thai. Involve your household. Kids can help choose menus, pick a new vegetable or fruit to try, set the table or even help with simple food prep. Print a copy of the 5-day meal planning worksheet to get you started. Hopefully you learned a helpful tip, or maybe you have one to share… feel free to comment. Football season is here, which means tailgating and parties. Having delicious snacks and appetizers is a must when gathering to watch your favorite football teams, but most of the time what’s offered is laden with excessive calories, saturated fat, sodium, and sugar. You know the culprits–loaded nachos, dips, chips, burgers, wings, and sodas; not to mention alcohol. The list goes on. But party food does not have to be unhealthy. Being smart with your choices can help you avoid unnecessary calorie intake. Hosting a “watching” party of your own is a perfect opportunity to take control of the food environment. Nachos are a perennial fan favorite, but instead of using tortilla chips as the base, why not use fresh leafy greens and convert them into a taco salad? Add a protein option such as shredded chicken, pork, or black beans and additional fresh ingredients such as diced tomato, lime, cilantro, and sliced avocado with just a sprinkle of cheese. By having the salad portion as a base and the chips as a garnish or side, you are less likely to over-indulge on the chips while still feeling satisfied taste-wise. Instead of giant bowls of chips and crackers scattered all over the table, replace them with baked chips made from sliced zucchini or sweet potato. Add platters of fresh cut vegetables and fruit. Use reduced-fat, fat-free dairy ingredients or Greek yogurt in veggie dips. If you plan on making burgers and are using beef, try to look for the leanest choice. Be sure to provide plenty of fresh toppings such as the classic lettuce, tomato, and onion. When making wings, skip the breading and replace with a delicious marinade. Hot sauce is generally very low in calories and packs a punch of flavor and heat. Additional herbs and spices will help cut back on sodium. Eat a solid breakfast. Having a balanced meal (lean protein, fiber-rich carb, healthy fat, and even some vegetables) will make you less likely to munch on empty snacks all day. When you arrive, skim the buffet table visually to see what’s there. Plan what to grab. Try to make your plate resemble the MyPlate guide. Go sit somewhere away from the table to enjoy your food. Lingering around the food table makes it more likely you’ll eat more than you should. Drink plenty of water. Steer clear of sodas or juices/punches. Make a water infusion by adding fresh fruit or vegetables such as lemon, oranges, berries, cucumber, and/or mint. As for alcohol, keep your intake limited. There is nothing wrong with enjoying a couple drinks before or during the game, but having more than that exceeds the limit recommended by the Dietary Guidelines (one drink for women, two drinks for men). More can really tack on empty calories. Following these simple tips during game days will help set you up with the tools you need to stay healthy, while still having fun! Sometimes finding healthy foods to feed a family for dinner can be difficult. Long work days, soccer practices, and other activities make us want to rush to find the most convenient (and not always healthy) food options. Even when we have time to cook dinner it is sometimes hard to make sure that all of the food groups are represented. It doesn’t have to be this way. Here are some tips that the USDA (United States Department of Agriculture) gives to help you healthy up those meals. 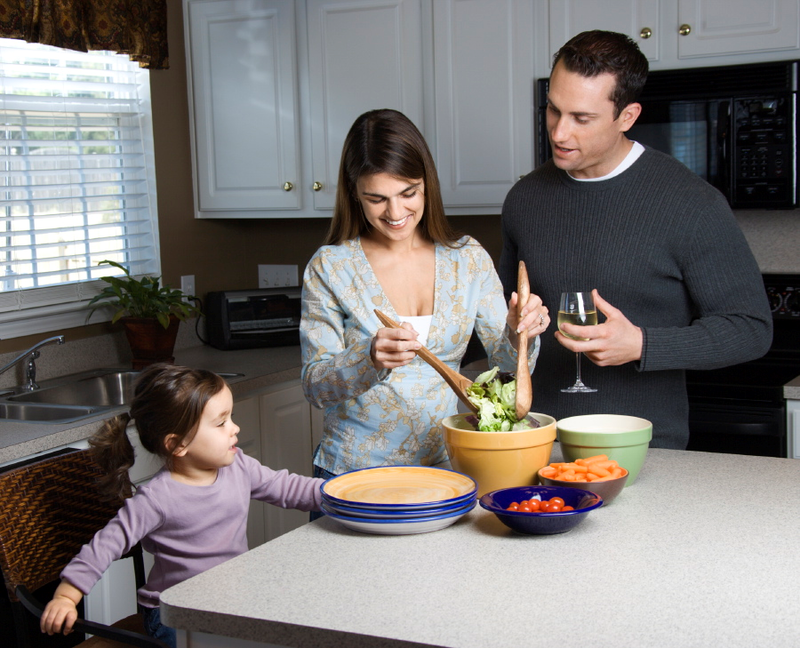 Follow MyPlate – MyPlate is a wonderful tool used to ensure that your family is meeting their nutritional needs for the day. Start by making half your plate fruits and vegetables and the other half protein and grains. Your fruits and vegetables should come in a variety of colors to make certain the different vitamins and minerals are represented. As far as grains, the USDA recommends making half your grains whole grains. Protein should also be lean and nutritious like lean beef and pork, or chicken, turkey, beans, or tofu. Try to make sure that fish are on your plate at least twice a week. Have a glass of low-fat or fat-free milk to include your dairy. Avoid Extra Fat – Look for ways to cut out the extra fat. Baking instead of frying chicken will reduce the fat content. Skip the gravy or sauces. For example, a rich cheese sauce is delicious with broccoli, but it adds unwanted fat. Try different herbs and spices instead for a different, but tasty alternative. Instead of having a slice of cake for dessert, reach for a bowl of fruit. It’s delicious and nutritious! Monitor Eating Methods – Many of us eat too fast. The problem with this is that it doesn’t give our stomachs enough time to tell our brain that we’re full before we’ve stuffed ourselves. Savor your meal. If you eat at a slow or modified pace your body will be better able to tell yourself that you are full. Another tip is to use a smaller plate. The bigger the plate, the more likely we are to fill it up. Try using a nine-inch plate and follow MyPlate as a guide. Know What You Eat – By cooking at home, you know exactly what is going into your food. You can adjust recipes to be healthier by adding less salt or using olive oil instead of solid fats. Cooking at home also gives you the opportunity to try new foods. Make a plan to try one new food each month. Your family may find their new favorite meal! If you do decide to eat out, try to obtain the nutritional information ahead of time so you know what you’re eating. Make your meals opportunities for better health. Incorporate the tips above to make sure that you are meeting the nutritional guidelines for both yourself and your family. For more tips, please visit www.choosemyplate.gov for information about all the food groups as well as information about your nutritional health. Let’s face it, not all of us get the recommended amount of dairy we need each day. 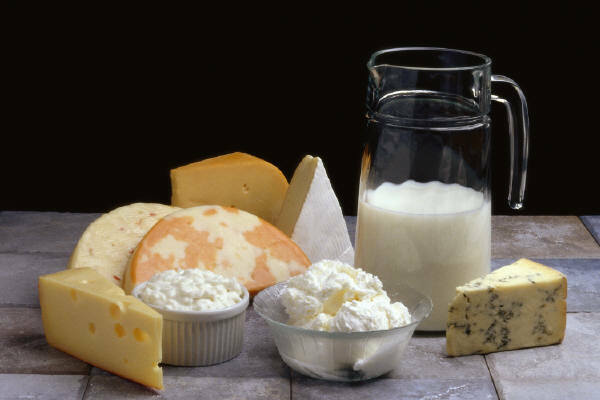 Sure, we may have a little milk in our coffee or a slice of cheese on our sandwich, but unless we get the recommended 3 cups a day for adults, we become at risk for being deficient in important nutrients like protein, potassium, Vitamin D, and calcium. Here are some tips that the USDA (United States Department of Agriculture) give to help you get more fat-free or low-fat dairy foods in your daily diet. Choose low-fat milk such as 1%, skim, or fat-free If you are currently drinking whole or 2%, gradually switch to a version with lower fat. Also, choose cheeses that are ‘reduced fat’ or ‘low-fat.’ Fat-free cheeses are healthy choices, but are not as good for cooking. Use low-fat yogurt instead of sour cream to top a baked potato or fruit salad. Also try using low-fat milk on oatmeal and cereal. Sweet dairy foods such as yogurts, flavored milks, puddings, and frozen yogurts are often high in added sugar. Check food labels to make sure it is a healthy dairy choice. If you are lactose intolerant try a lactose-free milk such as almond or soy milk. Use the nutrition facts label to make sure they have about 300 mg of calcium. You can also get some calcium in leafy greens, but unrealistic to meet all your daily dairy needs. Milk and yogurt are better choices than cheeses because they contain more potassium and less sodium, and many milk and yogurt products are fortified with vitamin D.
Model healthy choices for your children. Remember that your children are more likely to drink milk if they see you drinking milk. Try to include different dairy snacks into their lunch. Children 4 – 8 years old need 2 ½ cups daily, children 2 to 3 years old need 2 cups, and older children and teenagers need 3 cups. Whatever foods you choose to meet your dietary guidelines for the dairy food group just remember that “reduced fat,” “low-fat,” or “fat-free” options are always best. Try to do whatever you can to meet the 3 cup a day requirement. Remember to try different dairy foods to see what works for you. For more tips, please visit www.choosemyplate.gov for information about dairy and all the other food groups as well as information about your nutrition health. Reviewed by: Linnette Goard, Field Specialist, Food Safety, Selection and Management, Family and Consumer Sciences, Ohio State University Extension.